Bit of progress on the kiln. Made from a white-metal back2bay6 barrel and the end of a pen, as Steve said earlier about his efforts, this design of kiln saves a lot of space and suits the small environment, plus I agreed with Peter's comments other designs being harder to identify. Next stage is to play with washes and maybe chalks till I'm happy with the kilns appearance. More kiln progress...quite a bit of chalks/pastels on this, lots of blending together and mucky fingers, then all sealed together when I was filthy enough. Quite pleased with this, may add some more shading when everything settles and dries. demaine22 wrote: More kiln progress...quite a bit of chalks/pastels on this, lots of blending together and mucky fingers, then all sealed together when I was filthy enough. Certainly looking the part now Simon, good work on the weathering. Natural light is hard to come by at this time of year. 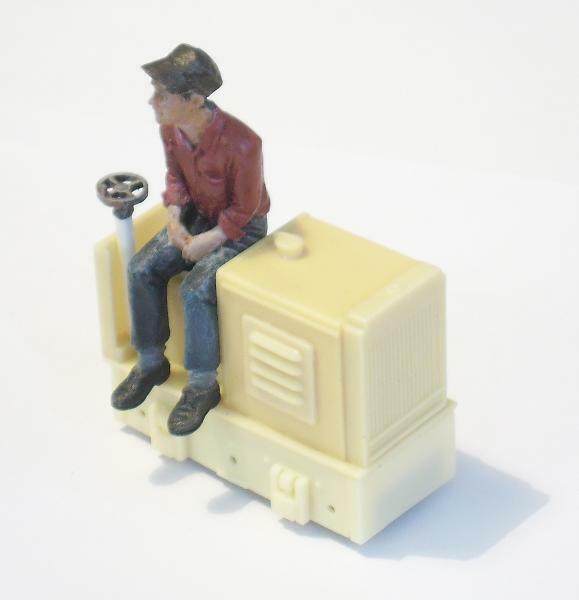 It's much easier to get consistant results with artificial light on small pieces like this. Then it doesnt matter what time of day or night or if the sun is shining, the light is always the same. Will do a post on my simple setup at the weekend. I quite enjoyed messing around with different inks and pastels until I was happy with what I had. I look forward to seeing your camera set-up, hopefully give me some ideas. Nice work Simon. Looking forward to the next update. This whole project has been a great learning curve, and getting results like this helps maintain the momentum. 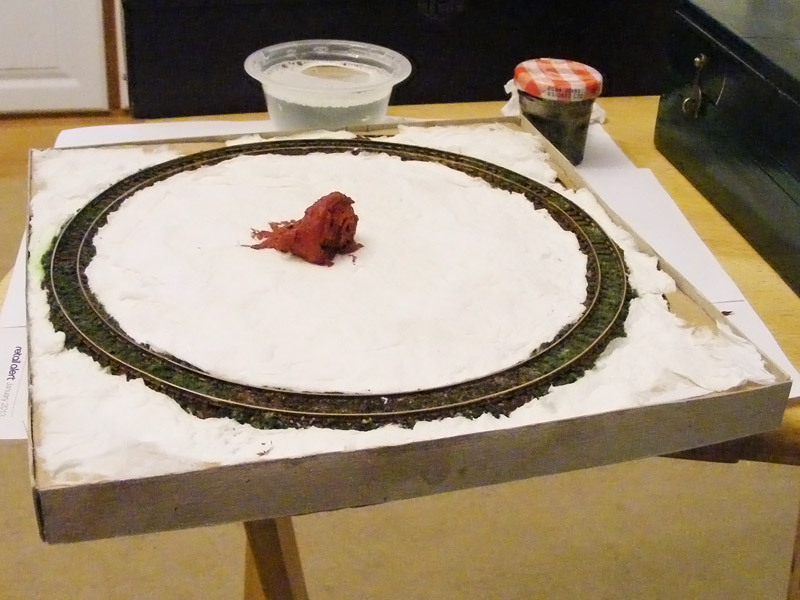 Last night I started work on the amended scenery, using old brush bristles, basket liner, sea moss, scatter and foam. 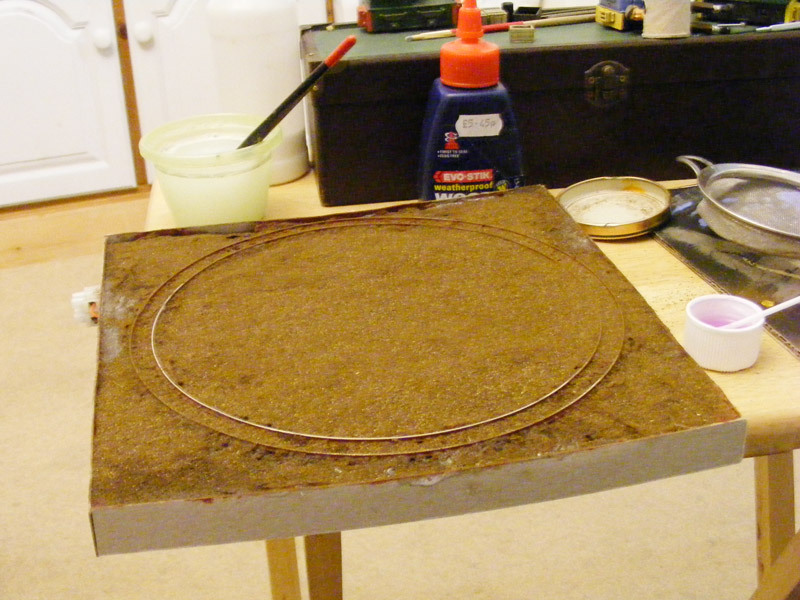 I have also made a base for the kiln from foamboard and filler, which needs painting and weathering to look more like concrete, and I need to add some ash around the bottom...I think I may put a fuel can nearby too...just to annoy 'elf and safety. 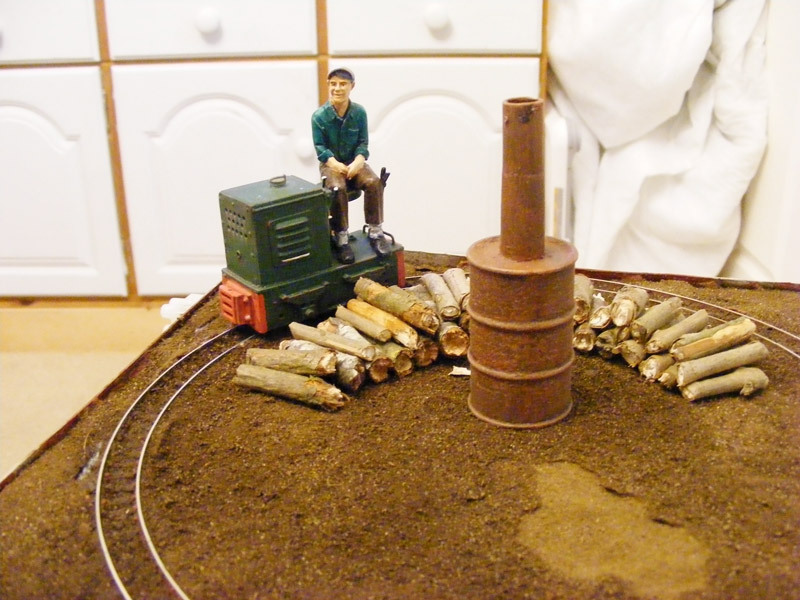 Another idea for a small cameo is to have a pile or container of logs in the right corner. I like just having the kiln in the centre. 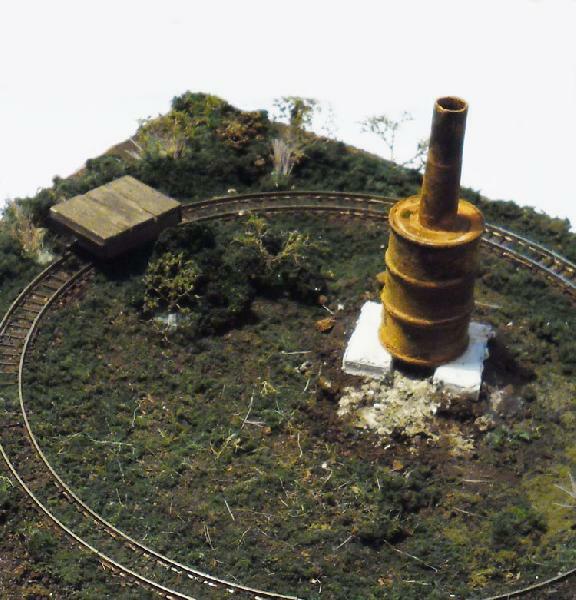 The log store is still around but I prefer this stripped back approach – too much on the scene will ruin it in my opinion. 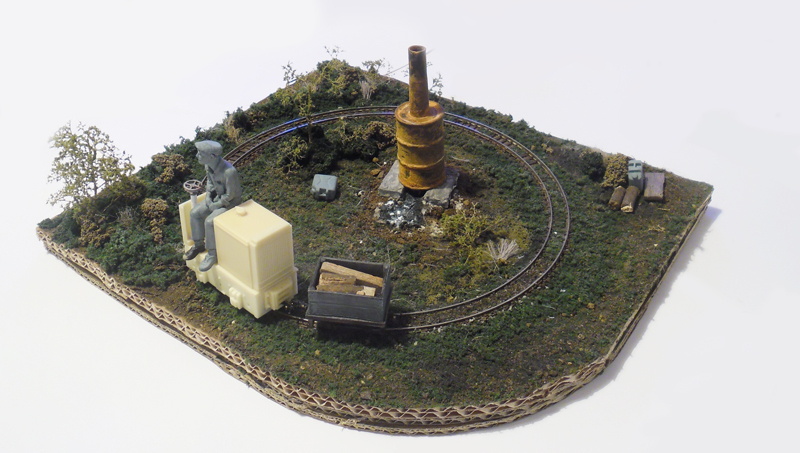 This close-up shows the kiln and a small wagon I have been working on a little closer, the wagon is a black dog chassis, with a balsa body, it's still being messed with at the moment, not too sure on the blocks acting as ballast on the bottom...they make the wagon look much wider. 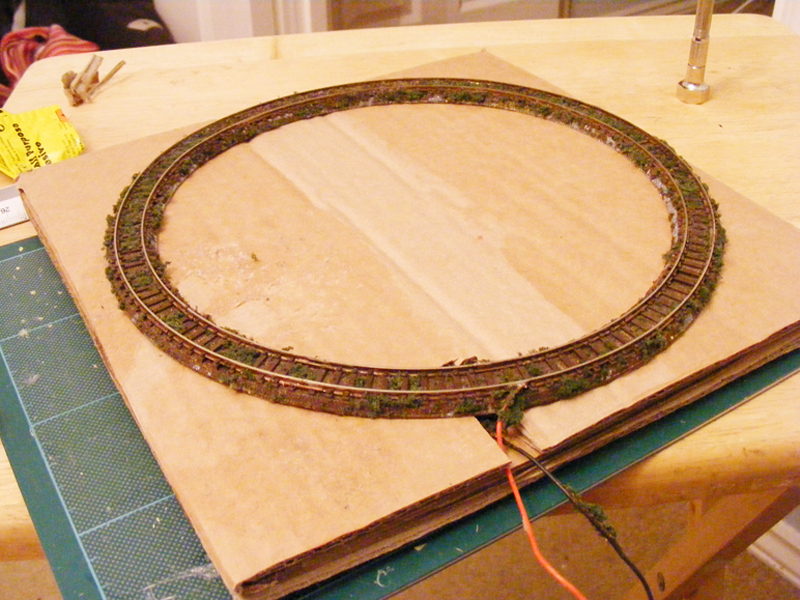 EDIT: Also just noticed I need to hoover the stray hairs/strands off the layout too! Thought I'd turn my attention to messing with the bits I got from Steve ages ago at MOMING this year. The brake handle is from my Tiny kit, and sits nicely on the centre of the pen I cut up for use with the kiln...bit of recycling there. 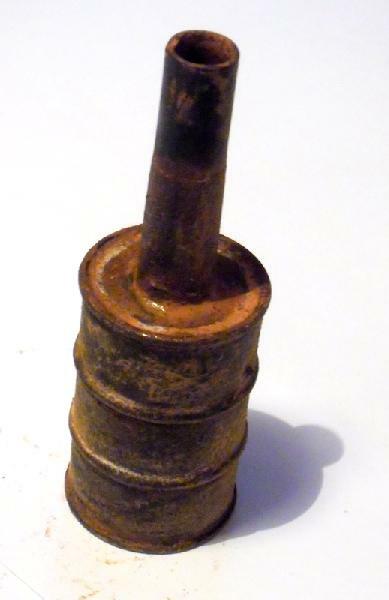 demaine22 wrote: Thought I'd turn my attention to messing with the bits I got from Steve ages ago at MOMING this year. I like the new stripped down version of the layout, has a nice open feel to it, but with enough to make it interesting. A few more small bits and pieces lying around will finish it off quite nicely. Steve Bennett wrote: I like the new stripped down version of the layout, has a nice open feel to it, but with enough to make it interesting. A few more small bits and pieces lying around will finish it off quite nicely. Thanks Steve, seeing the simple approaches of others made me want to pull everything back a little. I want to focus attention on the centre but still have life on the outside. 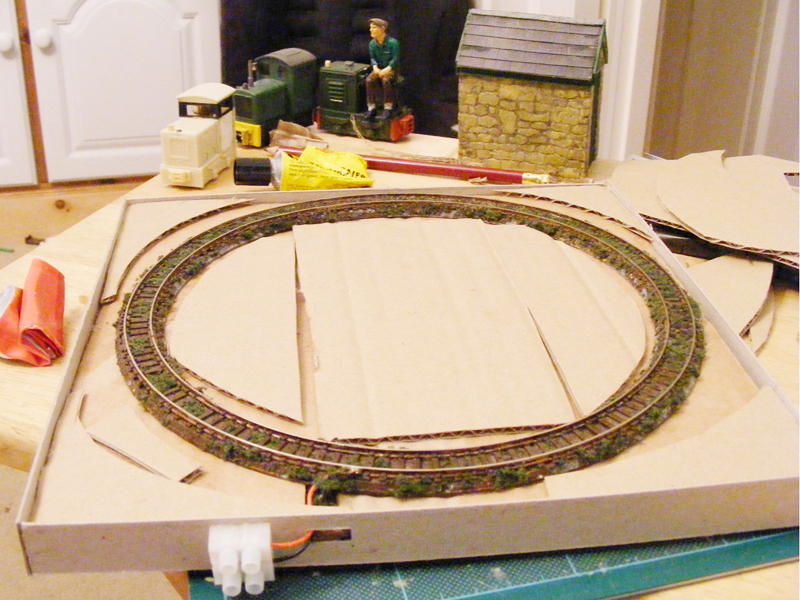 Making one of these layouts is quite theraputic - I'm quite tempted by the oval set you used for your tail chaser - one thing at a time though. 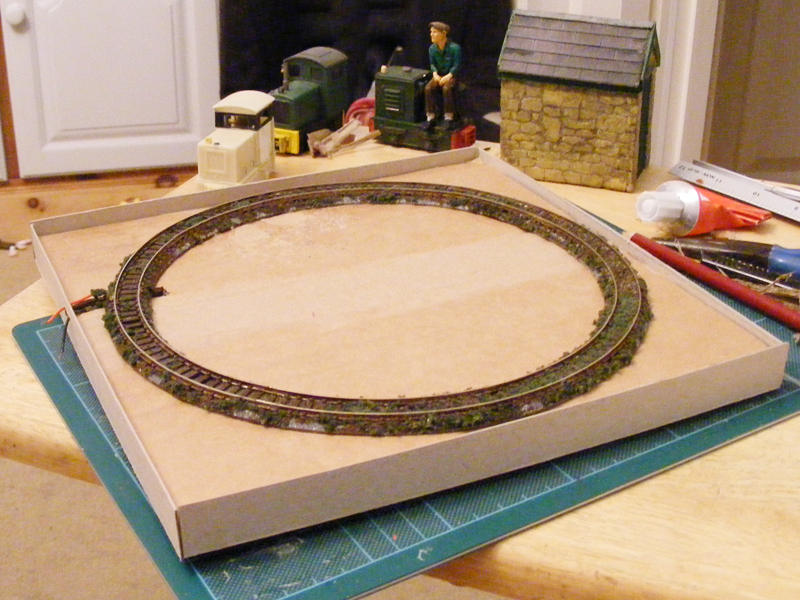 I have to admit the amount of time it took to get those loco bits together was pretty poor! Christmas called for a short modelling break recently, but I couldn't stay away for long after seeing the lovely work Barry, Gerry and Bob have all been doing recently and so last night I sat with Little Kiln for a couple of hours. I've made subtle additions, the scrap-wood pile seems to be acumilating on the right...with a bit of foliage next to it. Looking good Simon, however maybe this photo will help with your woodpile as charcoal burning is mostly done with Hornbeam which produces the best charcoal. 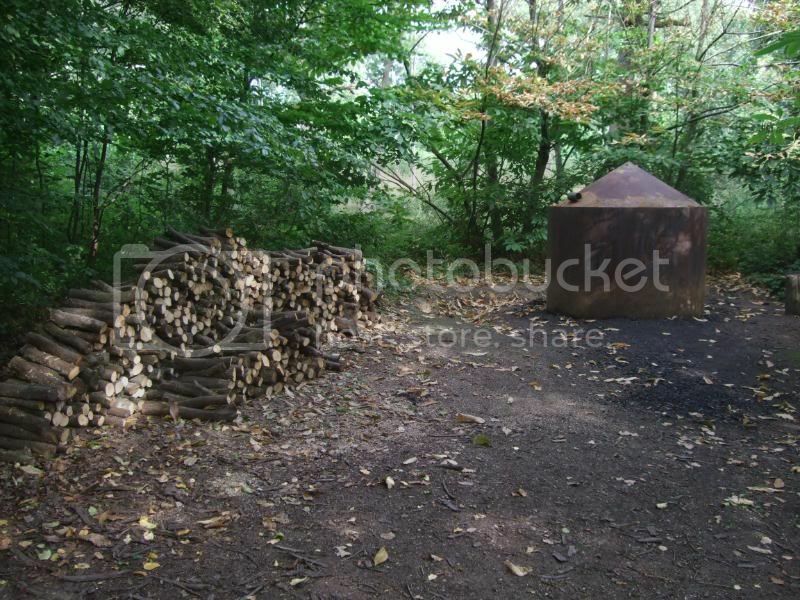 The logs are waiting to be used in the Essex Wildlife Trust Kiln in Pound Wood Thundersley. Thanks for that Gerry...that gives me and idea! Too long have I been away from Gnine...and it seems the idea Gerry gave me has plagued me for over a year! The original version of Little Kiln was scrapped midway through last year – I never liked the base to be honest, so I decided to go back to the beginning and try again. 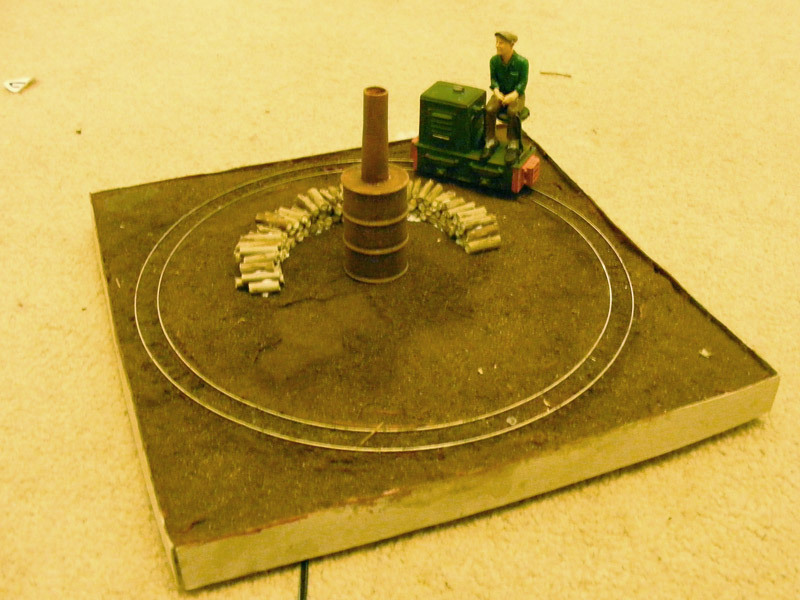 In total one cardboard box was used to make Little Kiln MK2. The remains were sliced up and thrown about to make filling the centre a lot easier! The power to the track is now much neater and I can simply plug in my controller and go...which is the whole idea with this little layout. 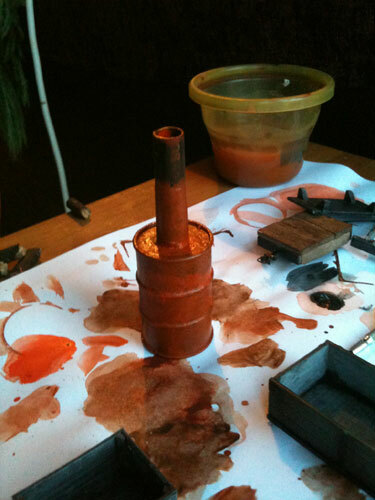 The start of MKII is looking good Simon, will be interested to see how it develops regardless of my comment. I will be keeping an eye on your progress. RAMMA Wood will feature a charcoal burning scene inspired by your previous posts. In an effort to encourage younger minds, I worked with the boy on adding tissue paper to pva with water and filling in areas of the layout...just to get messy and have fun really. 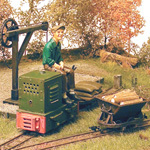 I'll go over this terrain again to level everything up but the boy enjoyed helping me and watching the locos go around. Shamefully an O9 one is whizzing round in the photo! 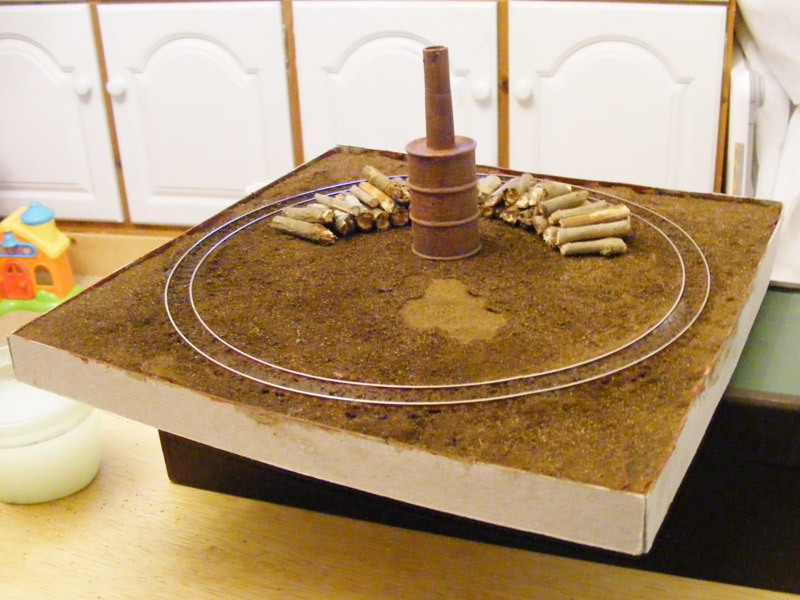 After a couple of evenings work the layout now has a base colour, covered in dirt, and the scene around it is starting to slowly take shape. 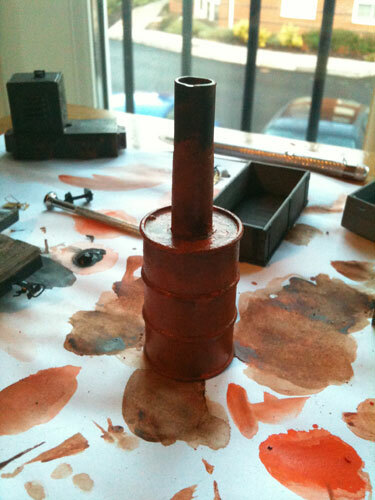 The colour is actually nice and effective around the rails, so I didn't wash that with ink. 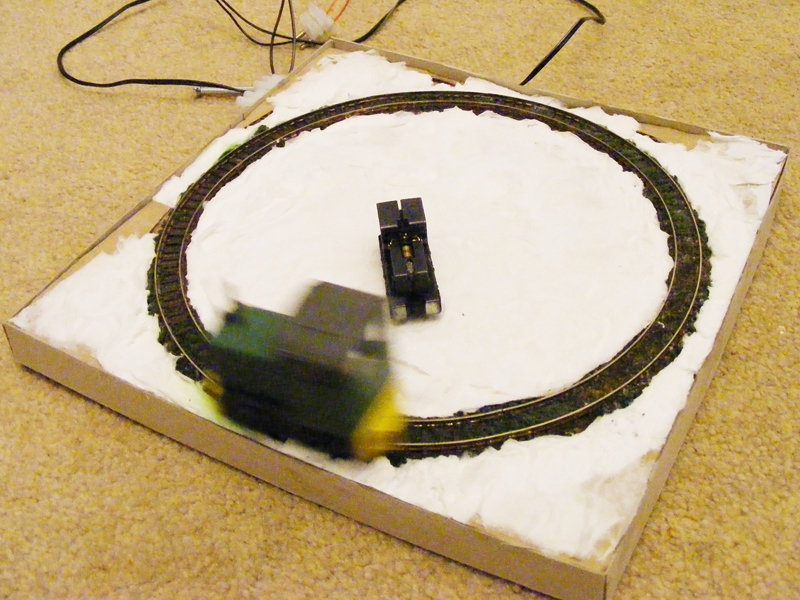 This blurry picture ow shows another evenings work, dirt carefully sieved over PVA and water, taking care around the rails afterwards using cotton buds and rubbing alcohol. 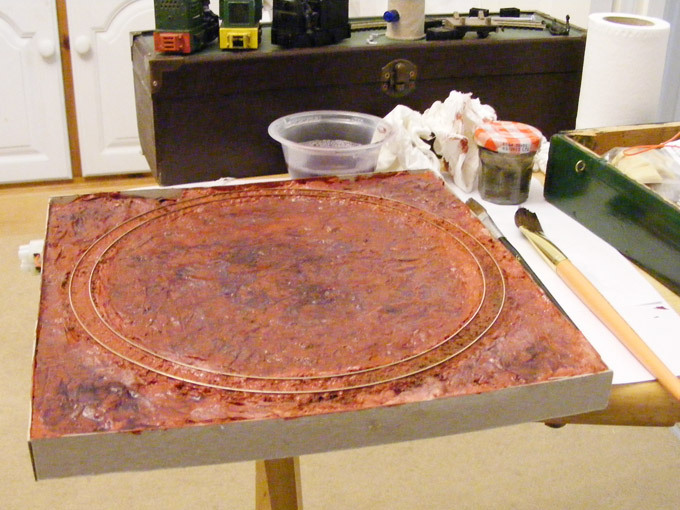 Once the first layer was dry, I applied another with more dirt, then sprayed dilute PVA over the top to seal the deal. And here we see the idea coming together – I need to gather a lot more sticks on my next walk with the dog! Grass will be added after I have the centre piece completed – it's good to be working on this again - why does Gnine keep drawing me back...? Your wood in relation to your small kiln is mega large. The Kiln I posted awhile back is 8' in diameter and is filled initially on a spoke type layout with Hornbeam of around 4-6" dia 4' long then after a few layers smaller pieces around 14" long are added until kiln is full. Wood for your kiln should be in length < half diameter of your Kiln and around 2-3mm in diameter. I'll be keeping in mind the dimensions etc when I look for more sticks later! Thanks for the heads up! 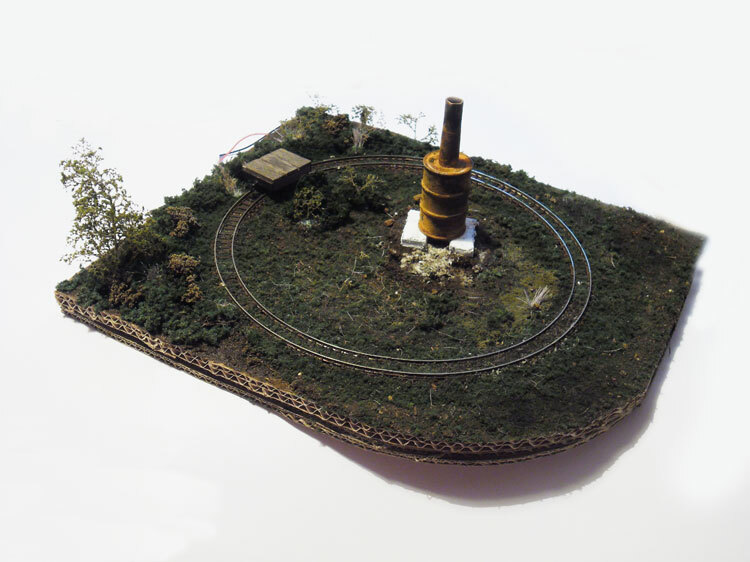 Interests: trains, photography, outdoor life. May I suggest flower sticks from your local garden shop, much cheaper then at a hobby shop. When you got them, use a steel brush or dremel tool or equal if you have it and brush along the sticks until you got strokes all over. Paint with a mixture of 1 part paint to 10 parts car window washer fluid. I use a mixture of brown and gray, usually Tamiya acrylics, but I guess any acrylic colour would do. Cut them of in pieces the last thing you do when dry. The light mixture makes the paint soak in a bit with a nice texture and not look as a layer on top, more as part of the wood bark. Thank you Simon, I'm sure your scenics will come out as great as always once you've finished! henrix72se wrote: When you got them, use a steel brush or dremel tool or equal if you have it and brush along the sticks until you got strokes all over. Paint with a mixture of 1 part paint to 10 parts car window washer fluid. I use a mixture of brown and gray, usually Tamiya acrylics, but I guess any acrylic colour would do. Cut them of in pieces the last thing you do when dry. The light mixture makes the paint soak in a bit with a nice texture and not look as a layer on top, more as part of the wood bark.